I'm taking a break from the house hunt to process District sales for January 2009. The tables below should give you an idea of how things looked. Update: a sharp-eyed reader commented incredulously about the table showing the average price for a semi-detached home in Ward 8 was more than $2M. I'll take part of the blame for that, while reserving the remainder for the District. I should have indicated more explicitly that these are unscrubbed values, i.e., I've not finished my analysis and cleaned up data errors - hence the word "preliminary" in the post's title. 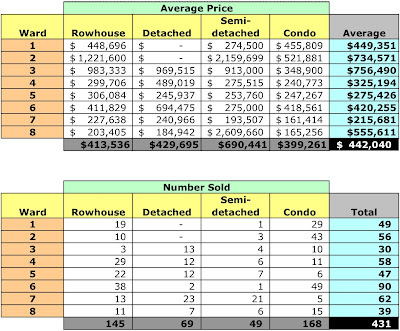 The District's data shows that one home sold for $14.6MM, hence the high average price. However, the District shouldn't be posting crappy data, as it has done for as long as I've been doing this. If ever the day came that streets were spelled correctly, prices were recorded correctly, addresses were recorded with their quadrant, and condo unit numbers were recorded with the property, I could spend more time adding value as opposed to doing the District's job [which I've already paid them to do with my high taxes]. I suspect, and will verify, that the house really sold for $146K. A word about the hunt, henceforth to be known as "la chasse de la maison," chasse for short. I've found two web sites to be extremely helpful in the chasse [my French teacher is cringing, I can hear her scream]: FranklyMLS.com and Redfin. They provide almost all the information anyone needs about properties for sale. FranklyMLS provides almost real time MLS data, displayed based on a wide range of search term possibilities. It lists current / previous prices [assuming the listing agent isn't gaming the MLS system], days on market, whether a listing is a short sale, etc. Mouse on the MLS number and a window appears with the property's photo and description. In general, I've found other real estate firms' web sites to be uninformative, limited, or, worst, more focused on their needs than mine, e.g., requiring me to register before showing me a listing. Is that a knuckleheaded approach to marketing or what? PN Hoffman's site, too, thinks that requiring me to register before showing me floor plans for the Warehouses at Union Row is a brilliant marketing idea. Easily spoofed [when their site works] so all they end up with is a database full of useless email IDs. However, to be fair, one real estate firm has a dynamite site: Sawbuck Realty. They use Google's mapping API to create an informative and easy to use web site. In fact, the best sites [Redfin, Frankly, and Sawbuck] marry real estate data and mapping technology to significantly improve the chasse experience. You've done well, Grasshoppers! I'm also a big fan of Redfin and Frankly MLS, as well as Frank's blog. I'll have to look into Sawbuck. Are you using an agent? I visit Frank's site a lot and I like that he does more than most agents, I have thought about using him. the average price of a semi-detached home in Ward 8 is 2.6 million? really? i know the Hillcrest neighborhood is affluent but those are detached..2.6 million for the poorest ward in dc seems a little off, maybe i'm wrong.